TheatreMAD – The Make A Difference Trust is one of 22 charities signed up for this amazing new race being promoted by Positive East. We aim to get a large group of runners and groups of runners to join us for this fun run, raising money for this fantastic cause. Please get in touch if you’d like to run or if you want to get a group together for the run. If you are running in a group, the group can have its own fundraising page for all the members of the group to promote for sponsorship donations. 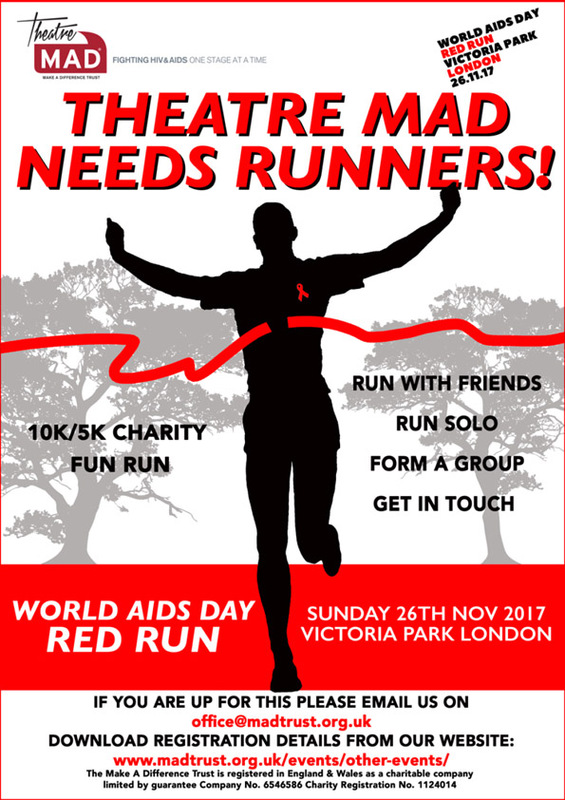 The annual World AIDS Day Red Run is a 10k/5k chipped timed charity fun run through east London’s Victoria Park to raise awareness of, and vital funds for, essential HIV services across the UK. Positive East have 22 charities signed on which is great. Positive East is really keen to create special event that brings together, and benefits, all involved in the fight against HIV.